The Egerton House Hotel is a stunning 30-room jewel located in the heart of Knightsbridge, only minutes from Harrods, making the hotel and its location, a shopper’s dream. The Egerton House Hotel, www.egertonhousehotel.com, is a stunning 30-room jewel located in the heart of Knightsbridge, only minutes from Harrods, making the hotel and its location, a shopper’s dream. From the minute guests enter this graceful townhouse hotel; they notice that luxurious appointments abound throughout the hotel, from the exquisite antique furnishings and paintings, elegant fresh floral arrangements, and impeccable service. Lightly scented candles burning on the white marble fireplace mantle provide reflected light in the charming reception room, where The Egerton House Hotel umbrellas stand ready for service just inside the door in an umbrella stand. In November, there was a chill in the air, but the inviting warmth of the fireplace in the stylish drawing room welcomed guests to come in and sit for a while, and they did. There was a large basket of fabulous white spray roses mixed with white lilies on a table, which gently perfumed the air in the hotel. The comfortable honor-bar room provides a relaxing spot to read the newspaper or a book, enjoy afternoon tea or have a cocktail in the evening. Edward F. Nesta and I were in London in November 2004, to attend the World Travel Market, (WTM), and had a lovely breakfast at The Egerton House Hotel with Acting General Manager, Sandra Anido and Sales and Marketing Manager, Jane Gordon. 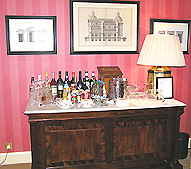 After our most enjoyable stay at the hotel in 2003, (read our Best of London article in Destinations), we were delighted to return and to note that the hotel still knows how to spoil their guests. Breakfast in the intimate dining room was a splendid affair, where the tables were set with crisply starched white linens, and the china was Villeroy & Boche’s Petit Fleur pattern. Service continues to be flawless, and guests are pampered with tempting baskets of freshly baked hot flaky croissants, palmiers and rolls, accompanied by delicious miniature jars of Wilkinson marmalades and preserves. From their breakfast menu, Edward and Sandra selected very delectable and hearty breakfasts of Eggs Benedict and Ham and Eggs, while Jane and I selected their lighter breakfast choices of the Exotic Fruit Platter and the Scottish Smoked Salmon. The Eggs Benedict were perfectly cooked according to Edward’s specifications and were accompanied by an amazing delicate Hollandaise sauce, and Sandra’ Eggs and Ham still sizzled on the plate. Jane’s fruit platter was not only healthy, but was an artistic colorful presentation of mixed fruit. When I saw the size of the Scottish Smoked Salmon, I knew I was having a very decadent treat, as the plate was heaped with tender salmon, of which I finished every last bite. We lingered over steaming hot French press coffee, tea and orange juice, as we enjoyed our delicious breakfast. The large bright guestrooms are individually decorated and furnished with gorgeous fabrics, paintings and antiques, and some of the guestrooms boast 4-poster beds with luxuriously draped canopies. The marble bathrooms feature Kenneth Turner amenities, robes and slippers, heated towel racks, and hairdryers. All the guestrooms are air-conditioned, have 2-line direct dial telephone with data port and voicemail, as well as satellite television. 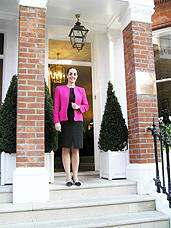 Read other articles on London in Hotels & Resorts, Destinations, Music Scene, Chef’s Recipes and Restaurants.